Superdry women’s Athetico cropped hoodie. We blurred the lines between studio and street with our fashion-forward Athletico cropped hoodie. Designed with high tech stretch technology and cool, light fabrics to provide you comfort for any occasion. 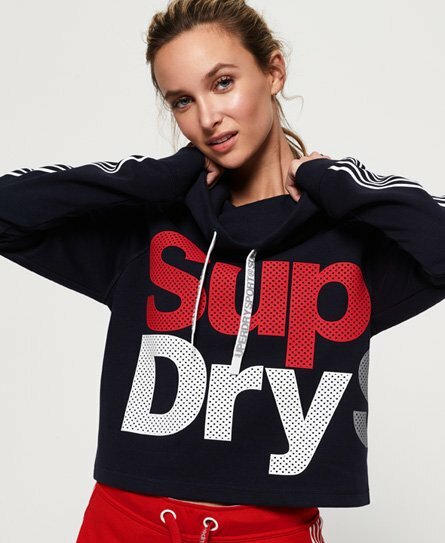 This hoodie features a branded draw cord hood, sporty stripe detailing down each sleeve a Superdry logo across the chest that continues onto the back, as well as ribbed cuffs for a comfortable fit. In addition, this hoodie has been decorated with a Superdry logo on the sleeve for the finishing touch.